Adventure Playground in Huntington Beach’s (CA) Central Park. A couple of Fridays ago C had the day off, and lucky him that meant that our entire family could head off for an adventure together… to the local Adventure Playground! Just follow the signs from the library in Huntington Beach’s Central Park to find your own adventures! Kids and adults help to build tree house-style forts down at Adventure Playground in Huntington Beach (CA). Located in Huntington Beach (CA), Adventure Playground is designed developmentally for children ages five and up, and it’s a playground like no other. Well, not exactly no other, but turns out that according to this NPR story, there are only THREE such adventure playgrounds remaining in operation throughout all of the United States, and all happen to be located in California. The one in Huntington Beach is one of two in Orange County (the other is in Irvine, CA), and the third is farther to the north in Berkeley, CA. T and a buddy row their raft in Adventure Playground’s shallow waters. Don’t bump into your friends, guys! Kids cross the rope bridge in an orderly, one-way fashion at Adventure Playground. T’s buddy rambled down the mudslide at Adventure Playground in Huntington Beach. T however opted not to give this one a try on this visit (maybe next summer!). A mother and child build a fort together. Doesn’t get better than that! T grabs a piece of scrap wood from the pile for the fort they built at Adventure Playground in Huntington Beach (CA). Forget the right shoes? Don’t worry as many leave their old sneakers behind so others can play safely at Adventure Playground in Huntington Beach (CA). Do note that water shoes are NOT allowed here and you will need to have an alternative, or borrow from the pile. Don’t worry, RMT’ers… if you get too dirty, there are changing rooms on-site along with small showers to help get the mud off (though I think the kids thought the showers were another element of the playground, hmm). So remember your change of clean clothes (along with shoes) and a towel or two! At the Adventure Playground in Huntington Beach, kids can row a wooden raft across a shallow pond with a buddy (or solo), traverse a rope bridge, ride down a mudslide, and build tree house-style forts out of scrap wood, tires, and nails using real hammers, saws, and other tools (gloves provided). Closed-toed shoes are required at all times throughout the park, and getting wet and dirty is pretty much par for the course. T wades over to C for another raft ride! C helps T connect with a friend while rafting in Adventure Playground. Docking successful! T and his friend pair up for a raft ride. The rules posted in the fort construction zone at Adventure Playground in Huntington Beach (CA). Do note that because of these rules this is one of the cleanest public park spaces I’ve ever encountered, making it hard to earn those extra nails! I think T liked the rafting best as he wanted to do this again and again and with all of his friends who attended the play date with him. A junior SUP’er after my own heart perhaps? But just as much as T liked the rafting, he really loved hunting down pieces of trash and broken nails all so that he and his friends (and all the parents helping them) could earn more nails to construct their fort. Yeah, forts and rafts are pretty close to one another in popularity not just with T but with all of the kids, given how often they’d race back and forth between activities. Lots of rules at Adventure Playground in Huntington Beach (CA), but it makes it so we all can have a safe and fun experience. This is just a part of our group checking in at Adventure Playground. Yep, their “office” is a sea container – love it! Upon checking in, staffers convene small groups of visitors to go over all the rules while inside the park, including the consequences for breaking the rules. They really do a great job at making sure we all stay safe while still having a great time. Thanks HB Parks and Rec! Well, the kids could race-walk between stations anyway. As explained to us during our introductory debriefing with Adventure Playground staff, there’s absolutely no running allowed at Adventure Playground at anytime, and the consequences for doing so are pretty strict. Staff is not shy about giving time-outs for breaking that rule among others, such as throwing or dropping materials inside of the construction areas, removing shoes, using the rafts and oars for anything but rafting and rowing, or going the wrong way on the mudslide or rope bridge. And the best part about all of these rules is that it was rare that I saw a kid put in time-out. Why? Because they wanted to be sure not to miss a single experience during their time at this most excellent playground. Can I please have one of these park staffers come home with me to re-tool and enforce our own house rules? T crossing the rope bridge at Adventure Playground in Huntington Beach (CA). A real saw – GASP! – at Adventure Playground. Yes, kids can and are encouraged to build with real materials here, including real tools. There’s nothing “kiddie” about this playground, and it’s about as far from the fenced-in tot-lot as you can get! You are probably wondering why there aren’t more of these types of play spaces for our kids. Adventure Playground looks like an awesome, unique playground as our kids mature from the usual playground equipment and want to build, climb, and conquer more and more challenges, doesn’t it? And it looks like the kids are having a blast, right? Yeah, it is pretty awesome and the kids LOVED it, but oh yes, that’s right, we Americans have a hankering to sue people if we get a splinter or fall down and scrape our knees (whereas in Europe where such legal fights are not as common; PS, they boast more than 1000 such playgrounds throughout their continent compared to our literal handful). But I’ll choose to look at the positive: California has all three of our nation’s remaining adventure playgrounds, and I’m going to do my best to support the two that are closest to us so our kids don’t lose those also. (You can read a recent news report on Irvine’s challenge to save their own adventure playground here and follow along with their years-long, grass-roots efforts here). A small portion of our group before entering Adventure Playground in Huntington Beach (CA). I would have posted an after, but honestly none of us (including the kids) got as dirty as we thought they would! The kids hanging out at Adventure Playground in Huntington Beach (CA). Are you ready for your own adventure, RMT’ers? Adventure Playground is located in Huntington Beach’s Central Park (enter from the Central Library parking lot) and is only open from mid-June through mid-August of each year. The closing date for the 2013 summer season is Friday August 9. Adult supervision is required and admission is $3 per child (children under two-years-old and adults are free of charge). Hours of operation are 10 a.m.-to-4 p.m., Monday through Saturday (closed Sunday). Play ends at 3:40 pm for cleanup. Picnics OK. You can read more rules and regulations here. For more information or to arrange an outing for a group of 10 children or more, please call (714) 842-7442 (or (714) 536-5486 when closed). 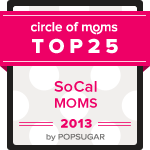 Please don’t forget to vote “Real Mom Time” as a Circle of Moms 2013 Top 25 Mom Blog in So Cal! You can do so by clicking here to vote directly; or, if you want to see the whole list, click the button above and scroll through and find me to vote next to my spot on the list. You can vote once daily through Tuesday July 30. Thank you so much! This entry was posted in Educational, Entertainment and tagged 2012, adventure playground, berkeley, building, california, central park, construction, create, creativity, development, dirt, family, forts, Huntington Beach, Irvine, kids, mud, park, playground, rafts, rope bridge, summer, treehouses, water. Bookmark the permalink.